Tinley Park, IL-(ENEWSPF)- If “a picture is worth a thousand words,” then perhaps a well-placed billboard is worth a hundred public events. That is the reasoning behind a new marketing effort launched this week by the SouthWest InterFaith Team (SWIFT), a 15-year-old collaboration among 18 area churches, synagogues and mosques in the Chicago Southland. Inspired at least in part by last year’s award-winning film Three Billboards Outside Ebbing, Missouri, SWIFT for the first time is sponsoring a billboard on Interstate 80/294, at the junction Halsted Street in Hazel Crest. Outfront Media, which owns the billboard, estimates that it is seen by more than 360,000 drivers per week. SWIFT’s primary focus is spreading peace and understanding, and the group hopes to spread this message to thousands and thousands of viewers with this outreach. Indeed, that message goes to the very heart of the group, which was started informally after 9/11, but became an official entity in 2003. The organization now boasts 18 member groups, including two Jewish congregations, four Muslim prayer centers and a dozen Christian entities of varying denominations, including Catholic, Methodist, Episcopalian, etc. “SWIFT remains relevant, active and determined, acting like a beacon of hope in this otherwise chaotic and divided world,” says SWIFT co-founder and former co-chair Khalid Mozaffar, a member of American Islamic Association in Frankfort. “This group offers a vibrant testament to the fact that People of Faith can be a positive, unifying, functional force in modern-day society. And that counters the false argument that Religion and its followers sew only hatred and division in our troubled world.” Through the billboard, he adds, SWIFT now aims to take its message of hope and harmony to a broader audience. “We want SWIFT to be that everlasting lighthouse and a beacon for many future generations,” adds Mozaffar. 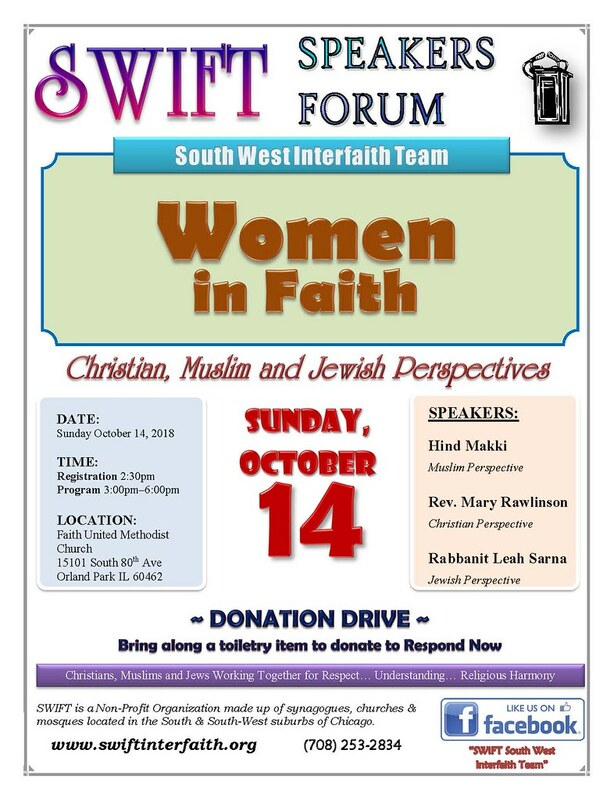 For more about SWIFT and to view videos of prior events, please visit the SWIFT Interfaith Facebook page, or go to SWIFTinterfaith.org.